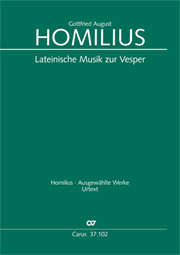 During his lifetime Homilius was regarded as one of the most famous and productive composers of sacred music, but in the 19th century he fell into oblivion. 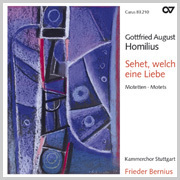 Only now is he being recognised in his role as one of the most important composers of the ‘Empfindsamer’, or sensitive, style. 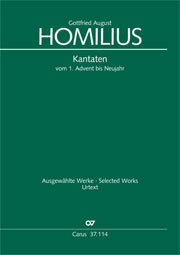 His motets clearly display the compositional characteristics of early classicism: the counterpoint is subordinated to the simple harmonies, the regularly-structured themes follow the ideal of the ‘unity of sentiment’ and of ‘pleasing, natural singing’. The collection contains something for all occasions and every level of difficulty. 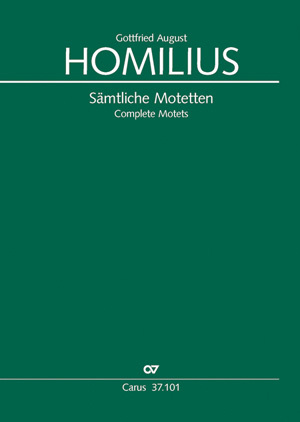 The informative foreword contains details about the composer’s life and work, together with suggestions for performance practice. 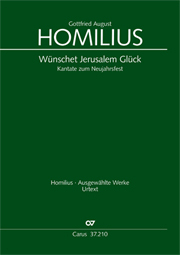 A detailed Critical Report completes the edition. 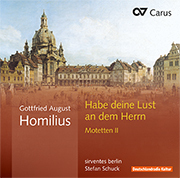 Es ist bemerkenswert und dem herausgebenden Carus-Verlag hoch anzurechnen, dass die Werke des lange Zeit in Vergessenheit geratenen und doch bedeutendsten Kirchenkomponisten des sogenannten »Empfindsamen Stiles« nicht nur als konzertante Musik, sondern dezidiert als sakrale Musik im Aufführungskontext des gottesdienstlichen und liturgischen Tuns verstanden werden, da dieser sowohl für die evangelische als auch für die katholische Kirchenmusik den Sonntagen im Kirchenjahr die passenden Motetten zuordnet.